Civionic Engineering has been contracted to develop ultra small, ultra precise and ultra low noise seismic sensors for our clients. 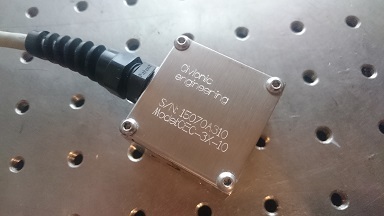 As a new product in competition to the seismic sensor market, our sensor is smaller than any existing ultra-low noise sensor on the market, includes a signal processing stage and is available in +/-1g to +/- 200g with a noise of <18ug/sqrt Hz. Being hermetically sealed and protected against the elements, we guarantee an IP67 protection. The small size of 40x40x30mm makes it very attractive to bridge owners, building owners and others. Contact us today for your copy of the specification sheet and a customized quotation.